Japanese manga expert Frederik L. Schodt will speak Friday, April 10, at 4 p.m. in the University of Wyoming College of Business auditorium. Author and translator Frederik L. Schodt will discuss Japanese manga (comics) Friday, April 10, from 4-5:30 p.m. in the University of Wyoming College of Business auditorium. Based in San Francisco, Schodt has written widely on Japanese history, popular culture and technology. His writings and his translations of manga helped trigger the current popularity of Japanese comics in the English-speaking world. In 2000, Schodt received the Special Category of the Asahi Shimbun's prestigious Osamu Tezuka Culture Award. In the same year, his translation of Henry Yoshitaka Kiyama's 1931 pioneering graphic novel, “The Four Immigrants Manga,” was selected as a finalist for a Pen West USA translation award. 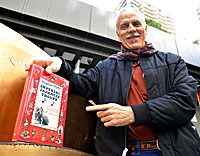 Schodt, in 2009, was awarded the Order of the Rising Sun, Gold Rays with Rosette, for his work to promote Japan's popular culture overseas. He was awarded the "Special" category of the Ministry of Foreign Affairs’ third International Manga Award. Schodt was invited to UW in conjunction with a new Japanese manga course and the first UW anime/manga conference April 10-11, with a magic tournament, dinner and costume ball. Free tickets are available on a first-come, first-served basis at the Wyoming Union information desk.